Need 24 Hour Locksmith Services? The 24 hour locksmith service allows United Locksmith to always be there for its customers. In the event of an emergency, you cannot wait until the morning. If you are locked out of your house, car or office your day does not stop because of the inconvenience. If your home is burglarized then you need new locks immediately. 24/7 coverage is the only way that we can offer assistance whenever people need it. Why do I need a 24 hour locksmith? This is a tricky question. The short answer is not necessarily. The long answer is that certain times of day are more likely to cost more. Very early in the morning and very late at night are the times that locksmiths will charge the most. For business owners, and technicians, this is one of the incentives to run a 24 hour locksmith shop. Anything in that grey area where you would need to think about whether is it late or early are the premium hours. At any other time of day the, cost should be based around more tangible parts of the job. Make sure that you are not being gouged. Find out the price before the work is started, and do not agree unless you are satisfied with the cost. No. Being an emergency locksmith has a lot of perks, but it is not sustainable for everyone. If the technician has a family or young children, they might not be able to go out at all hours of the night. Some areas cannot support a 24 hour locksmith. There might not be enough people in the town. A quiet city might not have enough activity after certain hours. The locksmith must also be able to serve a large enough area. Any limits on transportation, or the need to drive extremely long distances, will severely limit the profit for a locksmith that wants to be open 24 hours a day. It truly depends on the area that the locksmith is servicing. If there is a consistent stream of people year round, and that group is active at all times of the day, then the night time will probably be the busiest time. Somewhere that has a steady supply of tourists is perfect for a 24 hour locksmith. Big cities like, Los Angeles and New York City are locations that require quite a bit of night time work. Las Vegas also demands quite a bit of erratic hours. College towns might give 24 hour locksmiths sleepless nights at certain times of the year, but may also calm down during the winter and summer months. Night work is all about location, location, location. It takes a person in a certain time in their life, in a certain area, with a wide variety of skills. Usually, this is a young person’s game. There is a want to work more in order to gain experience and money. Young people also have the energy to work the long and erratic hours. Then on the other end of the spectrum there are the empty nesters. Older members of the locksmithing community that are in a similar position to the younger crowd. More than the incentive of making the extra money, this class of locksmith is more into the sense of purpose. It is about keeping busy and keeping up business. Other than age it also takes the correct location (see: How often does a 24 hour locksmith go out at night?). Finally, it comes down to the skills of the locksmith. An emergency locksmith must have a vast array of tools and a wide breadth of knowledge. Beyond that, they must also be able to troubleshoot unique and challenging problems. It is a high-stress job that requires training, preparedness, and ingenuity. Do 24 hour locksmiths turn down work? Usually, no. Being a 24 hour locksmith means that you are committed to helping the public in times of emergency. The business model of the company, or individual, might also make it hard to turn down any work. Some exceptions include when the locksmith suspects that the job is a prank. Similarly, if the locksmith suspects that the job may be a setup, they may turn it down. Mobile technicians have been known to get held up for their work vehicles, tools, and petty cash. More often than not, even if some sort of foul play is suspected, a locksmith will still take the job. They may take another technician to ride along, or just be extra cautious. Even if the work is turned down by one locksmith, professional courtesy would have them refer you to another company or technician. When the locksmith is currently at another job, or is too busy, they may also be forced to turn down work. If you are using a company like United Locksmith, all of this drama would happen behind the scenes, so the only news you get is that your locksmith is on their way. A twenty-four-hour locksmith does all the same duties of a standard locksmith. The difference is only in the hours they keep. However, because of those hours, the likelihood of some tasks are greater than others. Daytime hours are standard fare because that is when most locksmiths are open. 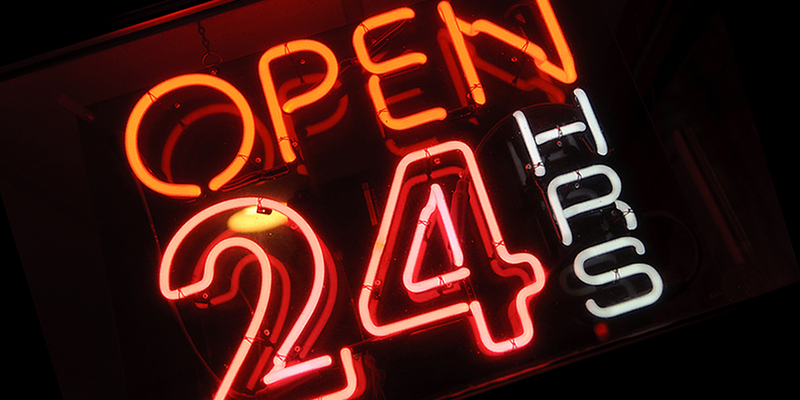 The night time and early morning hours are what a 24 hour locksmith capitalizes on. Mainly these are lockouts. Lockouts are when someone has forgotten or lost the keys for a home, office or vehicle and requires immediate access to their property. This may also include extracting a broken key, making a new key, etc. Other nighttime emergencies might come from law enforcement requesting help to enter a building. A home that has been burglarized may also need new locks immediately. Consultations and security assessments rarely happen in the night time hours.